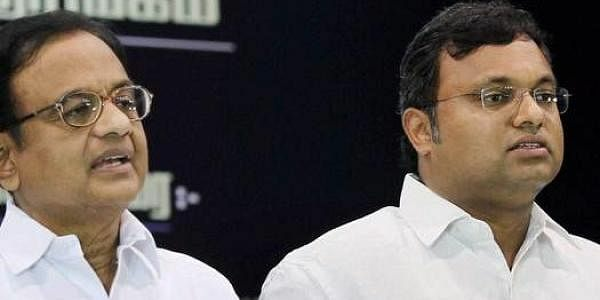 Both Karti Chidambaram and his father P Chidambaram have been lying for the last year-and-a-half, since The New Indian Express began exposing both from September 2015, on the critical subject of who owns Advantage Strategic Consultancy Private Limited (Advantage India), with its subsidiary in Singapore (Advantage Singapore), which gets questionable money and owns huge global wealth. Now straight to the core issue. The only issue that stands between Karti and jail today is whether Advantage twins are indirectly owned or controlled by Karti or not. Karti denies he indirectly owns Advantage. And his father defends him. The FIR filed by the CBI on 15th May last as reported in the media says that Karti had brokered for the Peter and Indrani Mukherjee couple-owned INX Media Private Limited (INX) for issue of foreign investment permits by his father’s ministry, for which payments were made by INX to Advantage. If Karti is proved to own Advantage indirectly, he will face jail, perhaps accompanied by his father too in view of the alleged bribe payments by INX. Advantage twins then are the smoking gun. In which owner’s hands it is found ultimately, will decide who is the offender. After the CBI action against Karti in INX Media, it is necessary to recall The New Indian Express exposes and see who holds the smoking gun - namely who indirectly owns and controls the Advantage twins. NIE exposes virtually corroborate the CBI case against Karti and his father in the INX affair. In the hands of Karti? Undeniably Karti was the owner of two-thirds of Advantage on record from March 2006 to May 2011 through Ausbridge Holdings and Investments Private Limited (Ausbridge), which he owned almost entirely. In 2011, Karti transferred the ownership of Ausbridge to Mohanan Rajesh, his close friend. Karti did this because the media had begun probing his business interests. In May 2012 media published how Karti had owned Advantage from 2006 to 2011. Since 2011, the ultimate shareholders and directors of Advantage have been Karti’s close friends and associates. If they are benamis of Karti, then, in law, Karti will be the true owner and controller of Advantage twins and the smoking gun will be found in his hands. The three articles that had appeared in the NIE (Sept 17, 2015, Oct 15, 2015 and April 26, 2016) had brought out these facts and exposed who really owned Advantage. The last article had also revealed that Advantage had acquired properties and wealth in some 20 countries all over the world. The final article (NIE April 26, 2016 titled Will Chidambaram stop lying at least from now?) proves that the friends of Karti who hold the shares of Advantage are his benamis, and now fixes the father and son in the CBI case in INX matter. Out of the five lakh shares of Advantage India, three lakh shares (or 60% ownership) were held in the names of four persons - C B N Reddy, known as Karti’s shadow (211430 shares), Padma Viswanathan and Ravi Viswanathan (32600 shares) and Bhaskararaman (17400 shares), Karti’s other friends. The four had executed Wills giving the entire 60% ownership of Advantage India to Chidambaram’s granddaughter and Karti’s daughter, Aditi Nalini Chidambaram. As Advantage India fully owns Advantage Singapore, the gift to Aditi implicitly includes the global wealth of hundreds of crores of rupees held by the latter. All Wills were uniformly executed on the same day - 19th June 2013, identical in language and content. In three of them, the first witness is C B N Reddy. In C B N Reddy’s Will, Ravi Viswanathan is the witness. The second witness for all four Wills is one V Murali. All Wills divide the properties into two parts. One, the Will writer’s own assets and the other, the shares in Advantage and other companies. They give away their own properties, which are relatively worth very little, to their spouse and children. And Will away the Advantage shares worth hundreds of crores of rupees not to their children but to Chidambaram’s granddaughter and Karti’s daughter! In their Wills the four benamis explain why they have given away such massive wealth, of all persons, to Chidambaram’s grandchild. C B N Reddy, who has gifted over 42% of global empire held by Advantage India and Singapore twins, says that late Dr B Rangarajan - Karti’s father-in-law and Chidambaram’s sambandi - was his ‘friend, philosopher and guide’ to whose family, he felt, “deeply indebted”, and therefore as a token of his “love” for Rangarajan “family”, he was giving to Rangarajan’s beloved granddaughter and daughter of Srinidhi his shares in three companies listed by him, namely, Advantage (211430 shares), Kriya FMCG (22500 shares) and Rochester Technology Solutions P Ltd (5000 shares) - worth several hundreds of crores of rupees. A note on the company Kriya FMCG on Reddy’s list. It holds 38570 shares in Advantage, which was originally entirely owned by Srinidhi and Aditi Nalini Chidambaram. They had transferred it in its entirety to C B N Reddy in 2008. And in 2013 Reddy Wills them back to Aditi! Why did Karti’s wife and daughter transfer their shares to Reddy in 2008 and Karti got it Willed back from him in 2013? This was obviously to distance Advantage from the Chidambarams on record and take it back off the record. Like C B N Reddy, Ravi Viswanathan repeats the “friend, philosopher and guide” line in his Will. Bhaskararaman and Padma Viswanathan say, in their Wills, they ‘recognise the contribution made” by Dr Rangarajan to their “life, which is immeasurable”. All four Wills significantly avoid mentioning that Aditi was Chidambaram’s granddaughter or Karti’s daughter. But the four persons choose Karti as the all important Executor of the Wills. Why? In law, once a person executing the Will dies, Karti as the Executor will step into his or her shoes and own and control the Advantage shares. Normally is difficult to get an open and shut evidence to prove benami holdings as the true owner will normally trust the benamidars so much that there will not be any formal documentation of benamis. But here, by getting the four benamidars to execute Wills so that the Advantage shares did not go to their heirs if any of them died, Karti has provided an open and shut proof of benamis in Advantage holdings. And more, the Wills were found to be in the custody of Karti during the raids by Income Tax and Enforcement authorities on his and his friends’ premises in December 2015, implying that he got them executed. Photocopies of these Wills were printed in the NIE along with the article. The Wills account for three lakh (60%) shares of Advantage. What about the balance two lakh shares (40%) of Advantage held by Ausbridge? The ownership of Ausbridge was with Mohanan Rajesh, a neighbour and friend of Karti. Rajesh transferred his ownership of Ausbridge to Karti in 2006. Karti transferred it back to him in May 2011. Obviously Rajesh is a name lender for Karti - he gives the shares to Karti and takes it back as per Karti’s wish and needs. It needs no seer to say that the entire Advantage shares are held for the benefit of the Karti-PC family by Karti’s benamis. The CBI, when it probes, will get the evidence of the benamis who hold the shares for Karti. Now come to how Chidambaram’s responses to the NIE exposes establish his complicity. Till the deadly fact of Wills and benami were brought out, Chidambaram kept denying the facts exposed. He termed the first story of the NIE (17.9.2015) as so “ridiculous” and “laughable” that he thought it was “not necessary to issue a rebuttal”. But “as some other media had carried the same report recklessly, he could not remain silent” and would place the papers with lawyers to act. On the same day the NIE responded saying that it stood by its report and welcomed him to sue. Chidambaram remained silent and thereafter virtually backed out. On October 23, 2015, the NIE brought out the affidavit of the Commissioner of Income Tax before the Central Administrative Tribunal, which nailed Chidambaram’s lies. Chidambaram still remained silent. When the Income Tax and Enforcement departments raided Karti in December 2015, Chidambaram “condemned the attempt” to link Karti’s friends to his son and to “harass them”. He said: “If the government wants to target me, it should do so directly” adding “he and his family were quite prepared to face” the ‘malicious onslaught’ of the government. But after the NIE put out the Wills in April 2016 and established that the shares of Advantage were held benami for Karti, Chidambaram fell totally silent. Why doesn’t he simply sue the NIE if its exposes have been false and if the Wills are not true? Even now, he is welcome to sue the NIE as he had threatened us on September 21, 2015. The test in the FIR filed by the CBI is that if Advantage is indirectly owned by Karti, he will be found holding the smoking gun. That will seal the fate of both father and son. The FIR filed by the CBI action against Karti in the case of the Peter-Indrani Mukherjee couple media outfit INX Media Private Limited alleges that Karti had brokered for the Mukherjees to get illegal FIPB permits by leveraging his relation with his father who was the Finance Minister in 2007 and got paid for it in Advantage. The FIR says the payment was made to Advantage to conceal the fact that it was quid pro quo for Karti’s brokering services, which will fix him and his father. At that time in 2007, Karti was actually owning over 75% Advantage through Ausbridge as brought out by the NIE. After Karti divested himself of the ownership of Advantage on record, he got the benamis to execute Wills in favour of his daughter and kept the Wills in his possession. Neither Karti nor his father has, even after a year, denied the Wills or that they were found in Karti’s possession. Chidambaram, who had no guts to sue the NIE then, now says that the Modi government is so afraid of his weekly articles against it that it had put the CBI on him to shut his mouth. The simple truth is that both father and son are done in by the Wills, which prove the CBI case. As an astute lawyer Chidambaram cannot be unaware of it. Mr.Gurumoorthy. If there is such an overwhelming evidence of wrongdoing against Chidambaram, how is he getting anticipatory bail time and again? what is the secret? Is it possible that ED and CIB are pulling their punches and not presenting all evidence vigorously at the hearing of the bail application or Mr Chidambaram is very lucky to strike Judges with a very elastic interpretation of the law?